This couple’s love was sure put to the test. 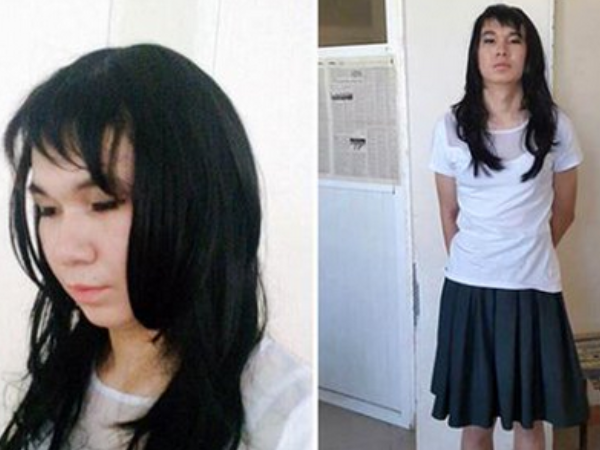 Ayan Zhademov, from Kazakhstan, has been fined the equivalent of R26 000 after he dressed up as his girlfriend and tried to sit her final exams for her. His girlfriend was reportedly terrified of taking United National Testing exam, a crucial test that determines university placement for Kazakh students. Ayan then decided to come to her rescue by putting on a black wig, his girlfriend’s skirt and blouse as well as some make-up. But Ayan’s attempt at scoring extra points backfired when he was stopped soon after entering the exam room. “We suspected it might be another woman that had taken the candidate’s place, but we never suspected it was a man that had taken her place. At least not until he started speaking. He tried speaking in a high voice but it was obvious then that he was a male,” revealed an exam board official. A local businessman was so impressed by Ayan’s courage he agreed to pay half of the fine. Some of the High School’s students were also impressed.